Pauline Iwersen DeHaan has lived in Point Roberts all of her life except for a seven year sojourn in her early twenties to San Francisco and across Canadian to get a taste of the outside world. When she was in school she remembers being fond of history and geography classes. She is a member of the historical society because her passion for the past and what created our local legends and historically significant events is still alive today. 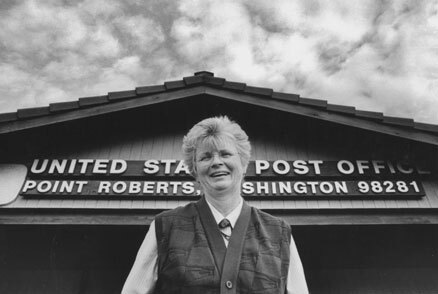 Her extremism has over filled her basement with archives and memorabilia of Point Roberts waiting for "the museum" to be created. In the 70's Pauline and a couple friends decided that The Point needed a newspaper so they collaborated to start the monthly Ocean Star. When Pauline is not recording history she is continuing to make her own. Her grandfather came to The Point in 1894. In her own family she and Fred, her husband of 40 years have three children and seven grand children. She knows most of the current local news makers since everyone comes to the Post Office where she has been the ever observant clerk for twenty years. "Point Roberts has made me happy and it's my place to call home."